Top : Materials : Fiberglass and Resin : Composite Cores : Chem-Trend L.P.
Chem-Trend's Chemlease® brand release agents have built a solid reputation within the FRP, RTM, solid surface and the advanced composites manufacturing industries for providing high-quality surface finishes and product integrity. Chemlease® products offer better surface quality right out of the mold, while eliminating much of the post-molding buffing and finishing operations often required in composite part manufacturing. Reducing the post-molding operations of composite manufacturing means greater productivity and higher profits. The complete line of Chemlease® release agents, mold cleaners, and mold sealers are formulated to work most effectively as a complete mold release system, giving customers the assurance that each process is optimized for maximum efficiency. 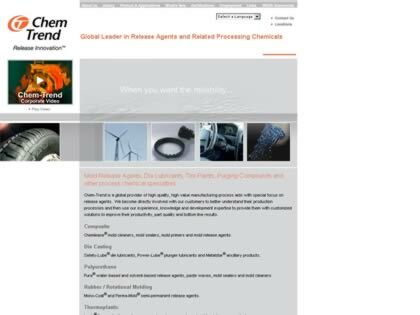 Web Site Snapshot: If available, above is a snapshot of the Chem-Trend L.P. web site at http://www.ChemTrend.com as it appeared when this site was added to the directory or last verified. Please Note that Boat Design Net has no involvement with the above web site; all content and images depicted in the above thumbnail are the property and copyright of Chem-Trend L.P. unless otherwise noted on that site. Description: Chem-Trend's Chemlease® brand release agents have built a solid reputation within the FRP, RTM, solid surface and the advanced composites manufacturing industries for providing high-quality surface finishes and product integrity. Chemlease® products offer better surface quality right out of the mold, while eliminating much of the post-molding buffing and finishing operations often required in composite part manufacturing. Reducing the post-molding operations of composite manufacturing means greater productivity and higher profits. The complete line of Chemlease® release agents, mold cleaners, and mold sealers are formulated to work most effectively as a complete mold release system, giving customers the assurance that each process is optimized for maximum efficiency.